On September 14, 2010 A-Line Asphalt Products, LLC located at 14 Rena St. in Newfield, NJ 08344 conducted their 2nd Contractor's seminar of the year. This informative seminar on Pre-formed Thermoplastics application procedures was conducted at our site and was geared for Paving, Sealcoating and Line striping Contractors. The seminar, led by Sales Representative Rusty Schindel of Flint Trading, Inc. discussed proper application, tools required and various Pre-formed Thermoplastic products. The key points for Pre-formed Thermoplastic installation on an asphalt is that the surface should be thoroughly cleaned - use a power blower to remove all debris from the asphalt surface. It is imperative that no moisture is present prior to positioning the Pre-formed Thermoplastic material on the pavement. You can dry the surface as needed with a propane torch. The material can be applied on asphalt, portland cement (free of all curing compounds), old or new previous applied Pre-formed Thermoplastic. If applying over old Pre-formed Thermoplastic, then the surface should be scraped of any loose material and remove the oxidized powder by grinding the surface or heating and scraping off the the oxidized layer to expose fresh material. You should not apply Pre-formed Thermoplastic on top of street paint or cold plastic. 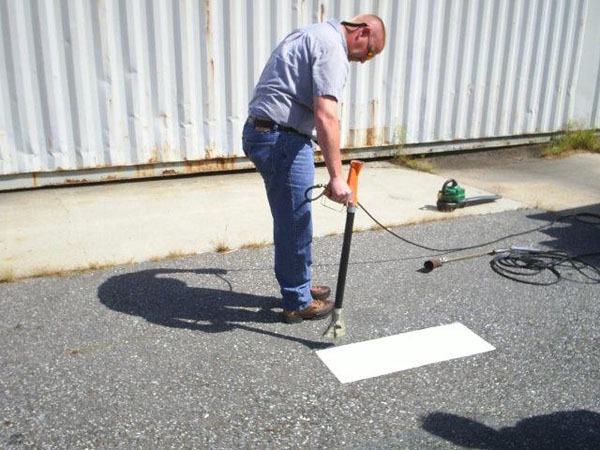 The material is applied with the exposed beaded side up, and is heated with a propane torch to evenly heat and adhere the material to the asphalt surface. Once properly installed, the Pre-formed Thermoplastic will cool in 10-15 minutes, and can be driven over (depending on outside ambient temperature). Pre-formed Thermoplastic material comes delivered in flat boxes, and should be stored flat and no higher that 25 packages. It should be kept in dry storage, indoors at a temperature range of 35 degrees F to 90 degrees F. Shelf life for the material is 12 months. Installation equipment required include propane fueled torch w/pressure regulator and 25' of hose, gas blower or broom, utility knife, tape measure, water sprayer (optional), chalk and chalk snap line, hammer and chisel.